It is great to have good press. 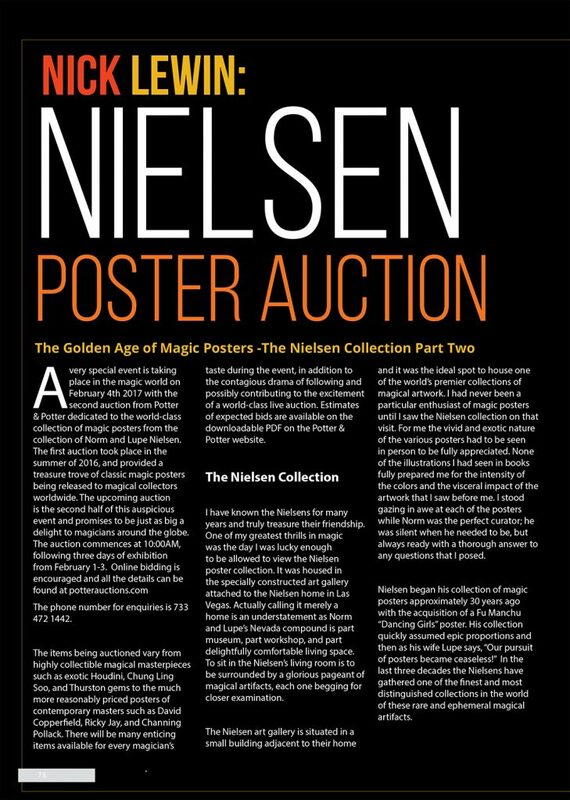 We are excited about the auction, as there will be many one-a-kind vintage magic posters for sale. Many rare Kellars, Houdinis, Thurstons, and Soos will be at the auction block. This is an opportunity that only comes rarely in one’s lifetime. This is where you can purchase some of the most rare and iconic images in the magic world. These are all original and well preserved. We hope these go to good, loving homes. Don’t miss this auction! Please click on the image below to see a beautiful article with fourteen pages of information. Thank you to Nick Lewin (the author), and Paul Romhany (editor of Vanish Magazine).